This workshop was so popular the first time, we're bringing it back! 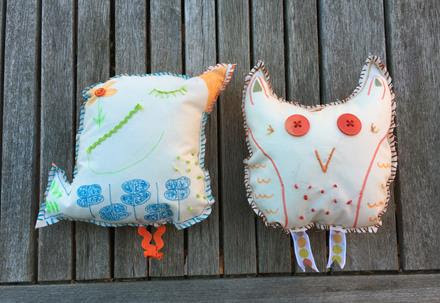 Kids can make their very own lovey! Under the guidance of textile artist, Virginia Catherall, they will design, stuff, stich, decorate and personalize a unique character, which is sure to become a family heirloom. Participants will learn how to do simple stitching such as sewing on a button, the whip stitch, and the French knot. Students will then learn how to stitch up the character with a backing and stuff it to create a lovey. They will get the chance to work with a needle, thimble, thread, fabric markers, and scissors. Embellishments such as buttons, ric rac, ribbons and appliques will be provided.